There is not likely to be a prospect in this year’s upcoming draft who brings five-tool potential to the table the way that this Wisconsin gym rat does. The product of his father’s indoor training facilities, the same facilities that former Wisconsin Badgers defensive lineman J.J. Watt has trained in. With access to those facilities at his fingertips, Kelenic has trained himself into becoming an all-around specialist. 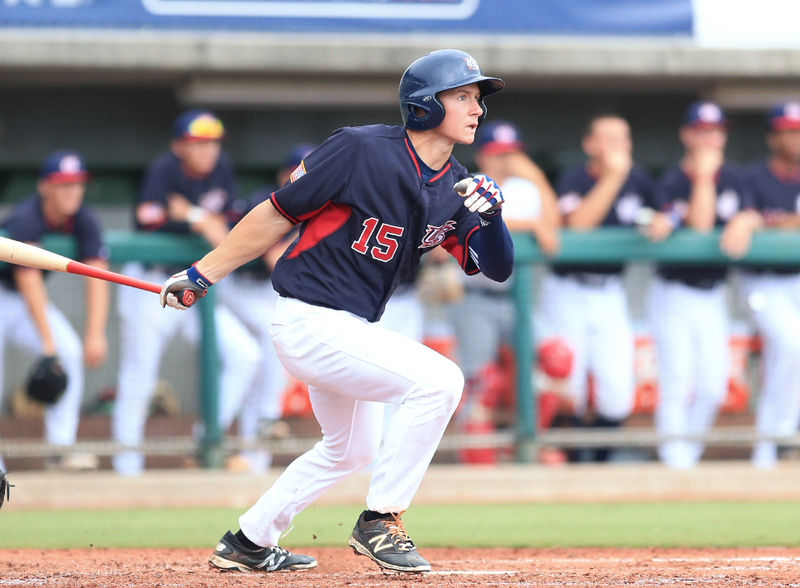 It starts at the plate where his speedy bat can generate 100 mph velocities off it while showing an ability to handle some of the best pitchers on the showcase circuit and with Team USA’s under-18 squad. As a hitter, he showed a patient approach with good contact skills against upper-level competition in both platforms which is somewhat surprising for a cold weather athlete who doesn’t get to face such high-end competition in his home state during his high school season. He does this with a swing that stays balanced, can hit the ball to all fields, and also shows the strength to explode on a ball to the pull side. The previously mentioned training and the upper-level competition he has faced will only help a player so much though, Kelenic’s above average hand speed is a born in trait that generates the type of barrel speed that can’t be taught, while his strength allows the bat path to stay in the zone, likely resulting in high averages in his future. Coming out of the left-handed hitter’s box Kelenic’s 6.57-second speed in the 60 allows him to steal some extra hits during a season while also allowing him to make an impact on the bases. That speed has already shown its ability to make an impact on defense in centerfield for Team USA and should he not lose much gives him a chance to stick in centerfield during his younger years. Along with that speed, his instincts, and paths to the ball should turn him into an above-average fielder in the future that alongside his rifle arm could help him have a chance to become a Gold Glove impact defender. That arm has registered fastballs in the low 90’s off the mound and as high as 96 mph from the outfield and comes with more accuracy than one generally sees from young outfielders when they’re letting it fly. From top to bottom this is a gifted athlete who has worked hard on his craft at a young age to push himself into becoming a possible Top 10 selection. As a five-tool player, it’s not likely that Kelenic would be available to the Royals at the 18th pick in a normal year when they would need to wait for a player to fall to their position, but this year’s draft doesn’t represent a normal year for the Royals. As it stands currently the Royals based on last year’s numbers have around $12.4m to spend in the draft which would give them the largest pool allotment based on those same figures from last year. While that amount doesn’t have what it takes to shove around the top 2 teams in the draft it is significant enough to push their weight around against team’s after that because they will have anywhere from $2.15m to $5.76m more money available to them than the teams that select at picks 3 through 17. That will change slightly should Alex Cobb eclipse $50m but even then a Moustakas one year deal will mitigate that loss and keep the Royals well ahead of the field. Knowing that Dayton Moore and Lonnie Goldberg will have this kind of leverage means they have the opportunity to push the player they desire to their spot should they want to spend what it takes to make it happen. How can they do this? By breaking the bank for one player ($7m+) the Royals can force the rest of the teams in front of them to either spend 70% or more of their draft allotment or choose someone else. The Braves last year were the only team that was pushed into that percentage with their selection of Kyle Wright and his $7m bonus demand. Is Kelenic a player who would be worthy of that kind of bonus? While that’s out for debate as I’ve written in the past it will likely take a prep player or draft-eligible sophomore with maximum leverage to push his way around in a draft.